Are you covered for Health, Dental or Vision? Getting health insurance coverage when you are healthy is undoubtedly one of the best decisions you will ever make. If you wait until you become ill or injured to apply for a health insurance plan, your coverage could be limited or even denied. If you are accepted, your premiums could be much higher and your existing medical conditions will not be covered, leaving you to pay for the costs associated with your illness. Provincial health plans generally do not cover prescription drugs, dental work or even treatments that happen outside the hospital or doctor’s office. Personal health insurance guarantees you access to affordable treatments and provides coverage towards expensive drugs, dental work and other costly health expenses. Health insurance helps to cover health expenses that are not covered by your provincial health plan. Government health plans typically only cover the cost of treatment and medications while you are in hospital and doctor’s visits. It is a wise decision to protect you and your family members from having to pay medical expenses out of pocket — and to get individual insurance while you are still healthy. Here are some examples of health care expenses an individual or family could incur. *Based on approximate drug costs to a person with a moderate to a severe case of the specified illness. Depending on the severity of the illness, the costs may be higher or lower then these listed. 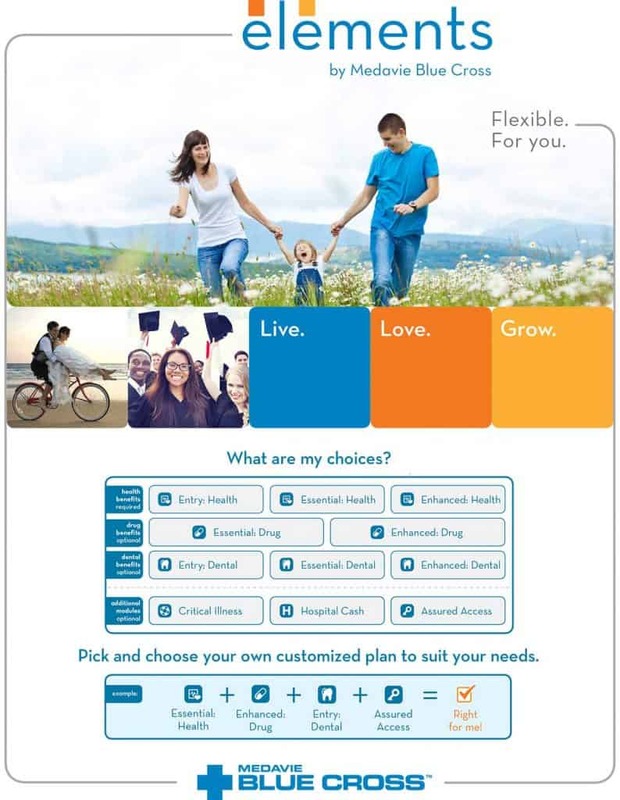 The Elements by Medavie Blue Cross health plan offers 6 different modules that can be mixed and matched to fit your needs and your budget. The end result is a flexible plan that can follow you through life. Whether you are a young adult at college or university, just starting out, self-employed, buying a home, ready to start a family or planning for retirement, there is a plan for you. Once you are accepted, you can change your plan to suit your time of life. As an agent for Medavie Blue Cross, we will be happy to work with you to develop the plan you need, at a price you can afford. In addition, we will keep in touch with you so that changes can be made to your plan during key life events like marriage, separation or divorce, and birth or adoption of a child. We are happy to be your personal Health Insurance Broker in Moncton. 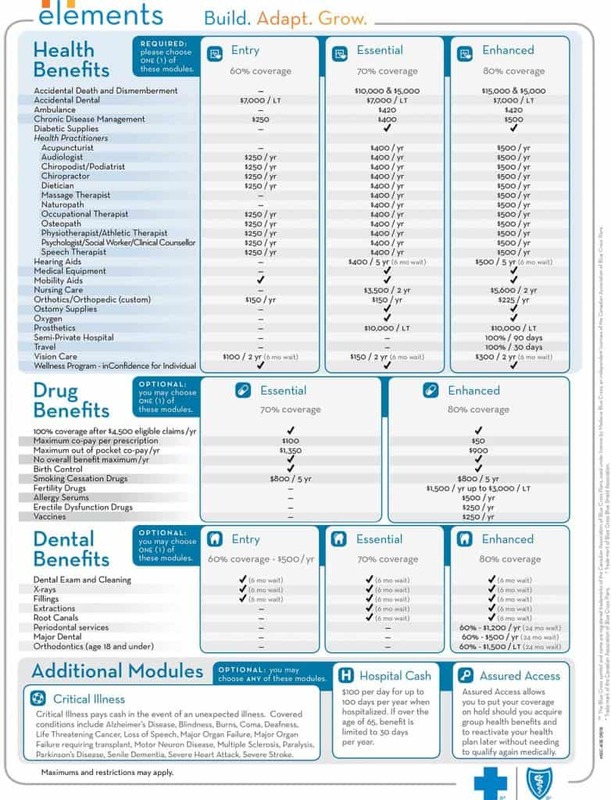 *At a minimum, a Health Module is required for every Elements Plan. *Maximums and restrictions may apply. No Matter if you live in Moncton or anywhere in Atlantic Canada we are happy to help you build your plan today! We are your personal health insurance agent in Moncton NB. Blue Country Insurance has been providing health insurance plans since 1999 in Moncton and Atlantic Canada.